Knee stretches are a vital part of any rehab programme for knee pain. Tight muscles change how forces go through the knee, making knee pain much more likely. Let me give you an example. Tight quads will pull on the knee cap, causing it to shift slightly. This exposes it to greater forces and friction often causing problems such as Chondromalacia Patella. Each muscle has an optimum length. Muscles are made of filaments that overlap with each other, like interlocking fingers. If a muscle is tight, the fibres overlap too much and as a result lack flexibility, which limits the amount of movement at the knee. Here we will start by looking at how to tell if your muscles are tight and then go on to talk about how to stretch safely. We will also look at how you can get the maximum benefit for the least effort when doing knee stretches. If you want to jump straight to knee stretches for specific muscles, chose from the following: Quads, Hamstrings, Calves, Glutes (Buttocks) or Iliotibial Band (ITB) stretches. How Can I Tell if my Muscles are Tight? The best way to tell if muscle tightness is causing or contributing to your pain is to see a physical therapist who can fully assess you. However there are some simple tests you can try at home that will give you an indication of any tightness. This is a case where it really is "no pain, no gain". Stretching effectively should be moderately uncomfortable (i.e. slightly unpleasant!) when you do it, but only in the muscle being stretched and the pain should stop as soon as you stop stretching. If you feel nothing or only slight discomfort when stretching, the exercise will likely not be very effective – you need to push it a bit further. However, if you have damaged a muscle e.g. hamstring tear, you should NOT start stretching too early – wait until you can use the muscle without pain before starting knee stretches. 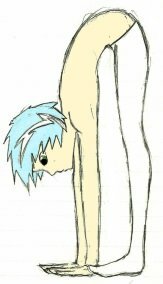 How Do I Do Knee Stretches? 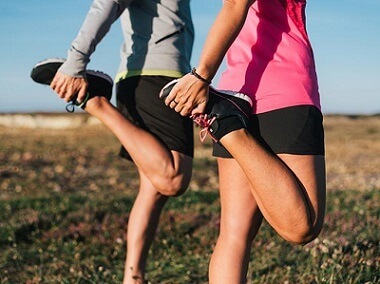 Stretching exercises have been proven to help decrease knee pain and reduce the chance of injury. People often make the mistake of starting by stretching their muscles. When there is muscle weakness, the other muscles around the knee try to compensate and provide stability themselves by tightening up to control knee movement. If you carry out knee stretches without first strengthening the muscles, you can actually cause more knee problems as you are taking away your body’s support structure making the knee less stable and putting more force through it. Therefore, I often advise people to start with knee strengthening exercises and then after a couple of weeks, add in knee stretches. Ideally, you want to be doing both alongside each other. So don't delay, start today!